Use a fork to mix flour and boiling water in a large bowl. Knead dough into a ball. Cover bowl with plastic wrap; let dough rest for 30 to 60 minutes. 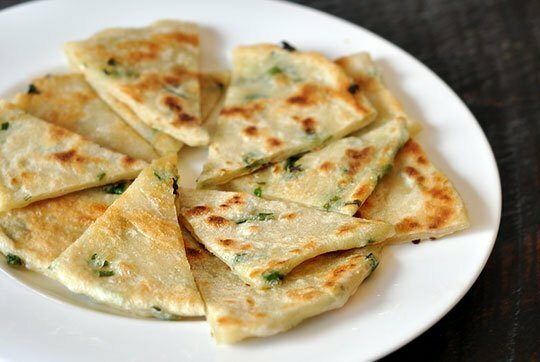 Evenly divide dough into 16 pieces. Roll each piece into a 1/4 inch thick circle. Brush each circle with oil, season with salt and pepper, and sprinkle with about 1 teaspoon of green onions. Roll up, cigar style, and pinch open ends together to form a circle. Roll each circle flat to 1/4 inch. Heat 2 teaspoons oil in a large skillet. Fry cakes until golden brown, about 2 minutes on each side.